Elizabeth "Betts" McGee and J.D. Langley believe their future together is a done deal. Picture them this one summer evening: They are relaxing on a glider swing, a pitcher of fresh lemonade at the ready. Pink and white roses are in bloom, mingling with the heat and humidity. J.D. surprises Betts with an engagement ring. They are 21, just out of college and so in love. All sweetness and light, right? Guess again. Consider J.D. 's mother, Louisa - no hot-house flower personality here. Her comment after hearing the news: "Tell me this, Elizabeth dear. Will you have the courage to wear white?" And, oh yes, a feud between the two families goes back for centuries - land-owning gentry (Langleys) vs. "common" merchants (McGees). The two families are gathered that evening at the Langley spread. When a thunderstorm arises, everyone tries to convince Betts' parents not to drive home. Everyone but the prickly Louisa, that is. The celebration ends in tragedy, unleashing a series of haunting events. Betts' mother is killed in a car accident and, in that instant, life changes. Betts, who blames Louisa for her mother's death, disappears, severing connections with her father, sister and lover. And, she carries with her a secret. For the first time, Dorothea Benton Frank alternates male/female voices in BULLS ISLAND (William Morrow; On Sale April 8, 2008; Hardcover; $24.95), telling the story from J.D. 's and Betts' points of view - a device that the author employs in her usual deft way to propel this tale to a stunning finale. Fast-forward some 18 years. Betts, still single, is in Manhattan, hauling in money as a rising star in an investment firm. She has stayed in touch with her wise girlfriend back in Charleston, Sela, who keeps her posted on life back home. As for J.D. - he married a woman selected by his mother, worthy of producing an heir. Once again, fate intervenes with these two. Betts is picked to represent her company's investment in multi-million dollar project to build a ritzy gated community on the pristine Bulls Island. It just happens to be near her home. It also happens that the Langley family is a partner in the project. Of course, nothing is smooth and easy about their reunion. Can Betts trust J.D. to build an eco-friendly community? Is their love still on fire after all these years apart? To say nothing of eco-terrorists determined to stop the development and J.D. 's super-angry, pill-popping wife on the loose. 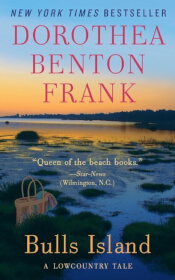 Dorothea Benton Frank mixes contemporary issues - ecology, land development, coastal protection - with traditional topics of romance, family and home. Her imaginative powers bring readers right to the scene - whether it's dinner at Sela's restaurant, the alligator-snapping Bulls Island, or the power offices in New York and Charleston. J.D. and Betts work together to create a new future for the island and for themselves. But before that happens, there are harrowing events that brings this entertaining novel to a satisfying conclusion. Bulls Island is a barrier island off the South Carolina coast, part of the Cape Romain National Wildlife Refuge. There are about 6,000 undeveloped acres with 8 1/2 miles of beach and 16 miles of interior walking trails. Dorothea Benton Frank directs readers to www.coastalexpeditions.com for ferry service to this magical place and to www.coastalconservationleague.org to learn about environmental protection. Dorothea Benton Frank is the author of seven New York Times best sellers, from 2000's SULLIVAN'S ISLAND to 2007's THE LAND OF MANGO SUNSETS. Before she began her writing career, Ms. Frank was involved extensively in the arts and education, and in raising awareness and funding for various non profits in New Jersey and New York. At the present time she holds an appointment on the NJ Cultural Trust and is a trustee of the SC Coastal Conservation League and a member of Writer's for Readers. She and her husband Peter currently divide their time between the New York Area and her hometown, Charleston, SC, where their two children are in college.